New Delhi, June 26 (IANS) His death in 1994 left a void in the Indian film music industry, but even over two decades later, R.D. Burman’s lilting melodies and soulful tunes continue to inspire and influence musicians and music aficionados alike, members of the fraternity say. Among the several veteran music directors who have graced the Indian film industry over the years, Burman, fondly called Pancham Da, would have turned 76 on Saturday. But he passed away when he was just 54. Filmmaker Brahmanand S. Siingh, who has released his latest work “Knowing Pancham” – an extensive collection of anecdotes, insights and observations on Burman – says the interest around the seminal music director’s life and legacy continues to grow. “Everybody is wanting to know more about R.D. Burman, the hunger never dies,” Siingh told IANS. Burman’s youthful exuberance, his diverse interests and his personality, too, have been spoken of in great detail in “Knowing Pancham”, he said. Siingh, who shares a “personal connect” with Burman’s timeless music, also said that he used his “own understanding of Pancham Da’s music” to create “Knowing Pancham”. Having earlier directed a documentary film titled “Pancham Unmixed” on the famed music director’s life and music, Siingh said youngsters need to understand why Pancham Da is regarded as a musical genius. “We often talk about Pancham Da’s genius, but we don’t exactly know why he was a genius. Youngsters need to understand music little better; have more time and patience and certain emotional intelligence to connect with his music,” he added. Siingh’s insights about R.D.Burman’s vast body of work, which includes timeless classics like “Chura liya hai tumne jo dil ko”, “Ek main aur ek tu”, “Tere bina jiya jaaye na”, are shared by musicians Tochi Raina and Benny Dayal, who will be singing unplugged versions of the legend’s famous tracks on 92.7 BIG FM’s tribute show “Yadon Mein Pancham” on Saturday. Benny Dayal, a recipient of R.D. Burman Award for New Music Talent, says he “grew up listening to Pancham Da’s music”. He will be performing hit songs like “Sagar kinare dil ye pukare” and “O mere dil ke chain” at the radio station’s “Yadon Mein Pancham” tribute and says he has given his own “twist” to these numbers. “I have given my twist to it, but the structure remains the same. Pancham Da’s music is very rooted to a lot of people’s lives and if you change it, people may not appreciate it. Nobody will deny, you can take a guitar or a piano and re-arrange Pancham Da’s music and people will like it,” he told IANS. An attempt was made in the Bollywood film “Dil Vil Pyar Vyar”, which had an album full of re-arranged versions of Burman’s hit tracks. While it was musically appreciated, the movie didn’t fare too well at the box office. Singer Tochi Raina, who has lent his voice for popular songs like “Iktara” and “Saibo”, says that there was a sense of “poetry” in all of Burman’s compositions. “Pancham Da’s compositions, his poetry was amazing. We can’t have the same thinking as him, but we can take inspiration from him,” he told IANS. 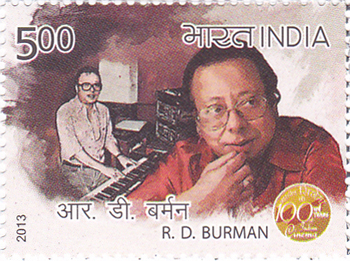 During his heydays, Burman pioneered in bringing western music to an unprecedented level in the Indian film industry and Tochi believes that he was able to do that with his analytical style of composing. “Pancham Da was a tabla player and then he learned western classical. He analysed the music and got inspired by poetry. And the lyrics had power. When I listen to his music, I analyse the kind of sounds he utilised,” he added. Known for his knack for experimentation with sounds, the legendary composer, who is known for evergreen songs like “Yaadon ki baraat”, “Tum bin jaaun kahan”, gave legendary singers Kishore Kumar, Asha Bhosle and Lata Mangeshkar some of the best tunes to lend their voices to.